French Hebrew poet and author; born at Fürth in 1760; died at Paris Nov. 5, 1826; father of Fromenthal and Léon Halévy. 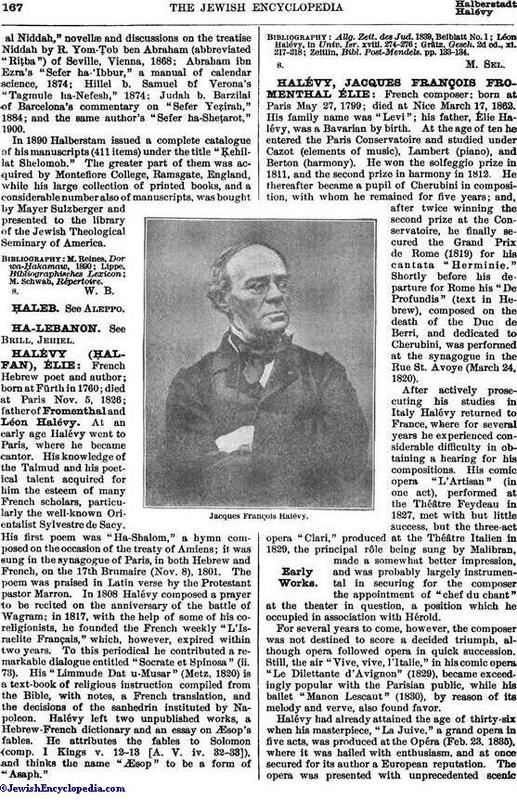 At an early age Halévy went to Paris, where he became cantor. His knowledge of the Talmud and his poetical talent acquired for him the esteem of many French scholars, particularly the well-known Orientalist Sylvestre de Sacy. His first poem was "Ha-Shalom," a hymn composed on the occasion of the treaty of Amiens; it was sung in the synagogue of Paris, in both Hebrew and French, on the 17th Brumaire (Nov. 8), 1801. The poem was praised in Latin verse by the Protestant pastor Marron. In 1808 Halévy composed a prayer to be recited on the anniversary of the battle of Wagram; in 1817, with the help of some of his co-religionists, he founded the French weekly "L'Israélite Français," which, however, expired within two years. To this periodical he contributed a remarkable dialogue entitled "Socrate et Spinosa" (ii. 73). His "Limmude Dat u-Musar" (Metz. 1820) is a text-book of religious instruction compiled from the Bible, with notes, a French translation, and the decisions of the sanhedrin instituted by Napoleon. Halévy left two unpublished works, a Hebrew-French dictionary and an essay on Æsop's fables. He attributes the fables to Solomon (comp. I Kings v. 12-13 [A. V. iv. 32-33]), and thinks the name "Æsop" to be a form of "Asaph." Zeitlin, Bibl. Post-Mendels. pp. 133-134.